No one has said it better, nor with greater passion. It was, most certainly, as Avnery described in painful detail, a disgusting exhibition of congressional subservience to the leader of a foreign power. This Congress is also guilty of a despicable act of defiance of the President of the United States, who is currently engaged in delicate negotiations to find peaceful solutions to the Middle East quagmire. The American mainstream media found nothing out of the ordinary as the US Congress enthusiastically embraced the words of Israeli Prime Minister Bibi Netanyahu, in a refutation of the long-standing American understanding that “partisanship stops at water’s edge”. In this instance it was not a partisan deviation. It was, instead a total capitulation of both parties to a foreign leader who stood before the members of Congress and ignored the ugly and costly results his own country’s policies have brought to both the Middle East and to the United States. There they were, the members of the highest legislative bodies of the world’s only superpower, flying up and down like so many yo-yos, applauding wildly, every few minutes or seconds, the most outrageous lies and distortions of Binyamin Netanyahu. . . .
Avnery writes that while Bibi’s speech was “finely crafted”, it can be summed up in one word, No. NO return to the 1967 borders. NO Palestinian capital in East Jerusalem. NO to even a symbolic return of some refugees. NO military withdrawal from the Jordan River – meaning that the future Palestinian state would be completely surrounded by the Israeli armed forces. NO negotiation with a Palestinian government “supported” by Hamas, even if there are no Hamas members in the government itself. And so on – NO. NO. NO. The aim is clearly to make sure that no Palestinian leader could even dream of entering negotiations, even in the unlikely event that he were ready to meet yet another condition: to recognize Israel as “the nation-state of the Jewish people” . . .
Netanyahu, along with his associates and political bedfellows, is determined to prevent the establishment of a Palestinian state by all and any means. That did not start with the present government – it is an aim deeply embedded in Zionist ideology and practice. Franklin Lamb, an American retired diplomat, now working in Washington and in Beirut, Lebanon, knows the American political scene from the inside. Lamb is a former Assistant Counsel of the US House Judiciary Committee. He has been a Professor of International Law at Northwestern College of Law in Oregon, earned his Law Degree at Boston University and his LLM, M.Phil, and PhD degrees at the London School of Economics. He is currently the director of Americans Concerned for Middle East Peace, Beirut-Washington DC. Lamb wrote an analysis for the Dubai-based site, My Catbird Seat, which examines the speech before the US Congress where members enthusiastically embraced Netanyahu and the policies of his right-wing Israeli government. He also identified, however, potential signs of hope among what could be a growing number of congressional staff members who reacted quite negatively to Netanyahu’s speech. The effects of the Arab Spring are being felt in both Houses of Congress as well as in numerous support agencies such as the Congressional Research Service of the Library of Congress”. Lamb’s investigation also led him to conclude that “virtually all Congressional staffers who objected to Netanyahu’s appearance before Congress expressed rejection of his following assertions as ludicrously false”. Those statements were applauded by those members of Congress so limited in their knowledge of the narrative Netanyahu was selling, that they believed him. Those few who did know the assertions were false, also applauded, on demand. Lamb also found that the applause moments that “erupted” during the speech, according to two staffers who work with the House Foreign Affairs Committee, were organized by AIPAC. AIPAC, as it always does with visiting Israeli officials, edited Netanyahu’s speech to identify points that assured “most favorable local consumption”. These points were marked as “applause lines”. Key Members such as Eric Cantor (R-VA), Steny Hoyer (D-MD), Senator Charles Schumer (D-NY) and Harry Reid (D-NV) were designated as floor leaders and were seated in strategic locations in the Chamber. Once Bibi began his speech, the floor leaders would leap up at the indicated cue phrases and begin to applaud enthusiastically. Anyone who has ever been a delegate to a decision-making gathering like a national Democratic or Republican national nominating convention, knows this drill. I have served as floor whip for several Democratic conventions. From those experiences, I can report that it works this way: the delegate chief in the trailer calls in and instructs the whip, “Lift up the signs and cheer”. During Bibi’s speech, the Big Four of Cantor, Hoyer, Schumer and Reid, had their carefully marked speech text. 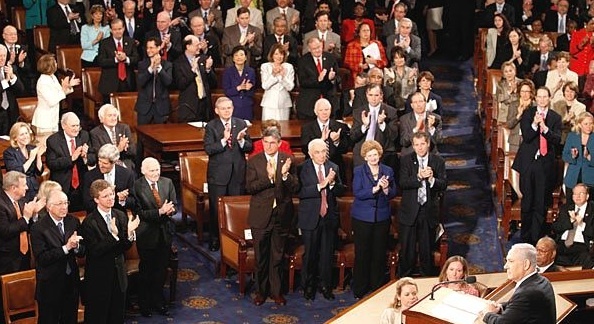 When they jumped up to cheer and applaud, all members of Congress followed their lead. Failure to do so could be costly in the next primary election. MJ Rosenberg writes this weekend about a 1988 experience he had as a Senate staffer. The story appears on the blog, Political Correction, a “Project of Media Matters Action Network”. Levin instantly understood what Shamir was saying. He was repudiating UN Security Council Resolutions 242 and 338 (which Israel had helped draft) which provided for “withdrawal of Israeli armed forces from territories occupied in the recent  conflict” in exchange for peace and security. Those resolutions represented official U.S. and international policy then, and they still do. But, in 1988, Shamir tried to declare them null and void. Levin asked me to draft a letter to Secretary of State George Shultz stating that it was the view of the Senate that the U.N. Resolutions remained the policy of the U.S. whether Shamir liked it or not. In great detail, Rosenberg continues with the story of his exciting journey through the jungle warfare that is the Israel Lobby, the Congress, the media (most notably, the New York Times‘ William Safire), and the White House. So what’s the moral? It is this: Criticizing Israel is dangerous business. On what other issue would a New York Times columnist call a Senate staffer and threaten to destroy his career? None. And why was a New York Times columnist acting as if he was working for the Israeli government? Safire wasn’t a journalist that day; he essentially was a representative of the Israeli government. Accordingly, is it any wonder the whole Congress abased itself the other day by jumping up and down and hurling love at Netanyahu? Who wants to mess with an 800-pound gorilla? Certainly not members of Congress. We conclude this narrative of a nation’s legislative leaders as they wander in the wilderness with a short clip of the Bibi Netanyahu performance before the US Congress. The picture above of the Congress applauding for one of 29 times is from Palestine Uprooted. The picture of Franklin Lamb is from My Catbird Seat. The clip of parts of Netanyahu’s performance before Congress is from C Span and is available on Youtube. I hope you are right about the staffers and the potential for change. My own representative, who knows nothing about the rest of the world, is one of the applauders and does not accept criticism of this or anything else. He has a lock on his west Texas seat (which makes me wonder why he needs the AIPAC support – he runs unopposed). I cannot account for his sycophantic behavior. It is sickening to watch this bunch of traitors. Sooner or later, the US will have to act in its best interests and end its “special relationship” with exclusionary/expansionist/illegal occupier/oppressor Israel. Only the utterly uninformed or pro-Israel zealots fail to understand that Israel is America’s number one geopolitical liability, a millstone around its neck. This article is very relevant and sane. I agree that it is preposterous for our Congress to behave in clear, rude and disastrous contradiction to the foreign policy efforts of the administration. Thanks Jim: You say it so well, are so articulate, and say everything I want to say. I was aghast at what Netanyahu said with our Congress applauding outlandishly. I was terribly sad. I knew it would be bad for him to address the Congress. But I didn’t know HOW BAD. We are familiar with Images of totalitiarian assemblies–e.g. North Korea–applauding on cue to the rehearsed pauses in their leaders’ addresses. How shocking it is, then, to see our elected representatives doing likewise, not for their own political leader, but in response to a foreigner who embodies values antithetical to those they pretend to profess! The whole scene was surreal and bizarre. It has to be deeply embarrassing to anyone who has taken the trouble even to vote for these abject kleptocrats. An utterly disgraceful scene exposing at once the impotence of purported American power and the vacuity of its democratic processes and claims to moral purpose. Thanks, Jim, for exposing the dangerous position of Israel’s Knesset in Washington, D.C. The outrageous spectacle demonstrated what each of Menahim Begin and Yitzak Shamir claimed when they were Prime Ministers of Israel; “The US Congress is in my hip pocket”. When Congress takes this position of blind servitude for a foreign leader and a foreign Zionist ideology, there are bound to be unintended, or even intended consequences. US interests that call for winning hearts and souls of the Arab people are currently below zero. the US which participated, along with Britain and USSR, in the creation of Israel, in the first place, is heading towards the creation of a monstrosity that is called,”Greater israel”, on the entirety of Historic Palestine. This will ensure that history books in the Arab World and the Muslim World will forever place the US as the enemy number one for 1.3 Billion people. President Obama will be able to avert this potential calamitous consequence by sticking to his position and siezing the moment by reaffirming the 1967 borders of Israel-Palestine, with minor equal swaps. Regardless, Palestinians should seek recognition as a state, with full membership in the UN. No promises or threats should stand in the way. The mindless support for Israel shown by this display in Congress is clear evidence of why the U.S. is unable to act as an honest broker in the Israeli-Palestinian conflict. As long as Israel is the tail that wags the dog of American Middle East policy, there is no chance of peace there. The simple fact is that there can be no peace for Israel until there is justice for the Palestinian people. When I saw the pictures on TV I thought that Mr. Bibi Netanyahu was speaking to the Likude Party Annual Convention. Then I found out that he was in the US Congress. And what surprised me more was that the Congress Men and Women gave him a big hand when he clearly rejected President Obama’s New Vision to the solution of the Palestinian Israeli Question!!!!!! It was shame on the US Congress. I agree with the statements above. When will the Congress become a deliberating body that works for justice and peace for all of God’s people? When will they travel to Palestine, and see what we saw when we travelled there back in 2006 – – and things are much worse now! If they could meet the Palestinians and visit their schools, they would have their eyes opened to the truth of the falsehoods they are cheering today. They need to visit Bethlehem, and meet the Rev. Mitri Raheb who founded the International Center in Bethlehem. They would hear what the Occupation has done to the Palestinians in the town of our Lord’s birth. They need to visit Ibillin, and witness the marvelous work of Archbishop Elias Chacour with the Mar Elias Educational Institution in “Building Peace on Desktops” etc… I, too, am saddened and angry that our Congress is “bought” by AIPAC and by many powerful corporations who are feeding them lies. We have lost our voice along with the Palestinians! Our Congressman here in the 2nd District in Washington State has also turned a deaf ear to our cries about what is really happening on the ground there in Israel and Palestine. This was eerily reminiscent of films we’ve all seen of Hitler’s speeches at the Zeppelinfeld in Nuremberg with crowds responding in choreographed lockstep. Like so much of Israeli behavior, this seemed psychologically sadistic, deliberately degrading our legislators by demanding public acclaim for open, shameless lies compelled by political extortion. They all knew they were being watched, filmed and graded for the pending election season. Our hopes ride with the third who declined to attend. Each of these comments resonate with me in its own way. I’d like readers to look at the image of John Kerry, Chair, Senate Foreign Relations Committee, in the left one-fourth of the group photo above. I know the face but can’t recall the name of the fellow Kerry is turning toward, but it seems to me that Kerry is nodding raptuously and indicating “Isn’t it just great to be here today, showing our collective appreciation for this true leader of his people, this great ally of America?” Kerry, folks: Chair, Senate Foreign Relations Committee…. I’m really curious: Did even Ron Paul, Bernie Sanders, Keith Elliot and Dennis Kucinich (among one or perhaps even two others) find it necessary to participate in the frenzied proof of our country’s entangling alliance with evil? It really cools my heart to know that there is still human decency in the US. These comments reflect the attitude of all Arabs, Muslims, and the majority of people in the world. How long will it take for these crucial comments to make their way into the lives of everyday Americans. Without them, there will be no peace. The speech should not have taken place to begin with, if so, Congress should only respond (applaud) to what would make the process of WORLD peace more achievable. Otherwise, the US and the rest of the world will keep living in tension because no one DARES to speak their mind. I do enjoy the fact that it exposes the glaring hypocrisy and pseudo-patriotism (more accurately known as nationalism) of the Tea Party and the more vocal and conservative members of the Republican Party. Despite all their protestations about our own government’s “meddling,” they are perfectly content to prostrate themselves before a foreign leader; even one who revels in his ability to thumb his nose at the United States. As a rare Episcopal Christian, who spent 22 years serving Temple Emanu-El as musician, organist, and choir director, I learned much about the notion that to Love Israel without qualification is a requirement not to be called “anti semitic.” Since Harry Truman’s naivete, the Zionists have clinched a grip on the USA Congress, and on our presidents, to convince that “Israel is USA best friend in the Middle East.” To say Bibi Netanyahu is disingenuous is an understatement…but he is firmly in the groove with all his predecessors. Menachem Begin spoke with his quaint accept about all of Israel, Judea, and Samaria being part of “Eretz Israel.” We had hoped Barack Obama could, and would, stand up to these lies and the stranglehold power of AIPAC ($63 million this year! ); instead Obama has joined his predecessors in “wimping out” and substituting “form for substance” in dealing with Israel. The real tragedy of this Greek/Shakespearian drama is that another holocaust will result, later if not sooner; it will not be the Battle of Megido so much loved by the fundamentalist protestants, either! Congress applauding and jumping up and down like a bunch of jumping beans was truly disgusting. Netanyahu’s barefaced lying was even worse. Saying that now all religous have unfettered access to Jerusalem is patently false. 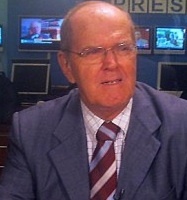 To say that the problem in the Middle East is not Israel; to say that Israel is not an occupier of Judea and Samaria; to say that Israel has removed hundreds of roadblocks; that only in Israel have Arabs got democratic rights; that Palestinians refused two “generous offers;’ the lies are too many to list. Our congressmen are either ignorant or so craven for AIPAC’s money they behave like North Koreans clapping for their dictator. Argh-h-h! Think Roman Senate: completely detached from Reality. We ARE Rome, crumbling from within.